Needlestick injuries in agriculture are common although not as recognized as those in human clinical settings. 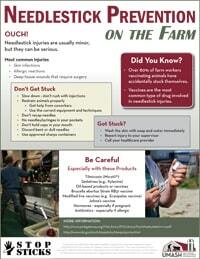 Farmers, ranchers, veterinarians and on site workers are susceptible to needlesticks on the job. These injuries can be serious and may require medical attention. 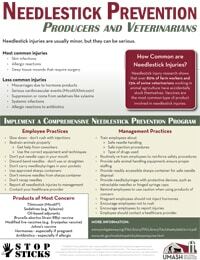 These needlestick prevention resources are intended to educate those individuals and prevent injuries in swine and dairy operations. The U.S. Food and Drug Administration is alerting veterinary medical professionals, as well as those who work with horses and pigs, that a synthetic progesterone (hormone) product commonly used in these animals may cause reproductive system disorders and other adverse effects in people who become exposed to the drug. The U.S. Food and Drug Administration is alerting cattle and sheep owners, farmworkers, veterinarians, physicians, emergency medical technicians, and other health care providers about the potential hazards to people exposed to the animal drug Micotil 300 (tilmicosin). There have been multiple reports of injury, and even death, in people following injection of Micotil 300. People exposed to Micotil 300 should immediately seek medical care. Being a farm kid and being raised around this stuff all our lives, we don't realize all the unsafe things we are around so seeing that made me realize that little everyday things I'm doing or around are not always as safe as I think they are. A well done resource for farm managers, for agribusinesses, veterinary services and healthcare clinicians to have on hand in their offices. They have been important resources to be sure our "learners" know how to stay safe! Honestly, I haven't been able to find better resources than yours! 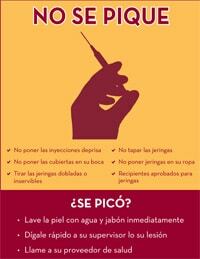 UMASH has developed the following needlestick prevention fact sheets and posters for farm workers, producers and veterinarians. These are high resolution pdfs – ready to print and hang! 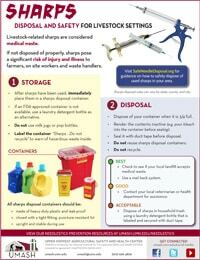 UMASH has developed videos on needlestick prevention on dairy farms and swine/hog farms. 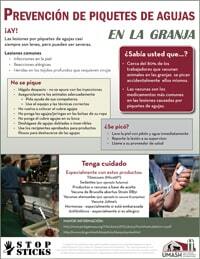 These videos are available in English and Spanish. These videos are provided for informational and educational purposes only. The content is solely the responsibility of the authors and does not necessarily represent the views of CDC/NIOSH or any other funders. View the videos directly on our site by clicking on them below, or download the video by right-clicking the “Download mp4” link below the video and saving the file. 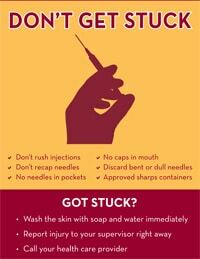 UMASH Center Co-Director, Dr. Jeff Bender, presented a needlestick prevention webinar on March 30, 2016. The webinar was hosted by the AgriSafe Network. The title of the webinar was “Don’t Get Stuck! Preventing Needlestick Injuries in Agricultural Settings”. In the webinar, Dr. Bender addressed the type of products that livestock producers and veterinarians are exposed to as well as preventive practices to reduce needlestick related injuries.